PROLOGUE: Writer and Director: Zakaia Cvitanovich. Cast: Zakaia Cvitanovich, Faisal Al-Jadir. Synopsis: Two directors at their wits end… before the audition. DOUBLE (the) TROUBLE: Writer: Zakaia Cvitanovich. Director: Ro Gilbert. Cast: Mc CandyBee, Maggie George, Sarah Bee, Ro Gilbert, Nav Naidoo. Synopsis: Opponents on and off the court… the match brings out the good, the bad and the ugly in the women as they strive for the win. 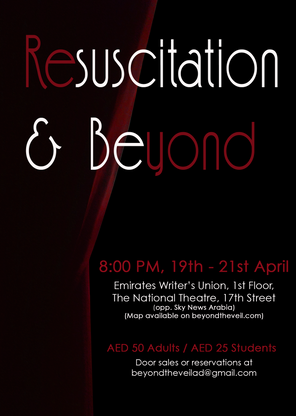 Venue: Emirates Writer's Union, The National Theatre. Written by: Saleh Karama Al Ameri. 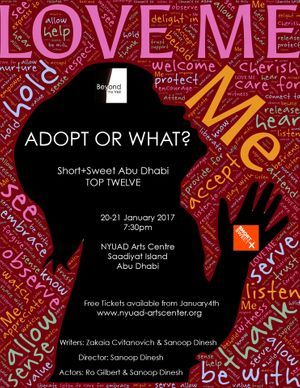 Cast: Fiona Makia, Majed alzubaidi, Nooreen Rahemtullah, Angeleene Abraham, Faisal Al-Jadir, May George, Shery Takawy, Pariya Ghofrani. Season: 2nd - 4th November, 2017. Background: Written in 2016, The Stores Are Now Open is a psychological probe into the universal concepts of marriage and materialism. Synopsis: Every night Murad waits for his wife to return home from work. The marriage is on the rocks due to Murad being unemployed and Lamis being sick of being the sole income earner. As she works her way up the corporate ladder, she torments him with stories of interest from other men. Deciding she’s had enough, she persuades the hapless maid to seduce him, so she’ll be able to catch him out and divorce him. It doesn’t work out that way… but by the end of the play, the husband has a job and the wife has done lots of shopping. Innovation: Grilled meat, popcorn, revolving doors and shopping. 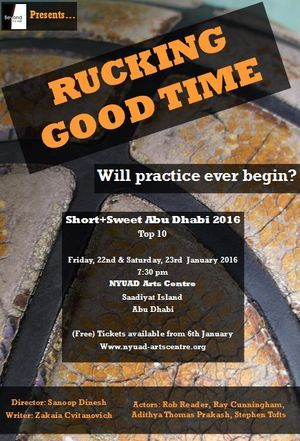 Background: This play won Best Overall Production, Best Director, Best Male Actor, Best Female Actor, Best New Comer, and People's Choice at Short+Sweet Abu Dhabi. It was performed in the Top 40 at Short+Sweet Dubai 2018, and reached the Finals. Background: This play was also performed in the Top 40 in Short+Sweet Dubai 2018. Synopsis: Too many choices… left or right… yes or no… too many choices until you realise, you never really had a choice! Written by: Zakaia Cvitanovich, Angeleene Abraham, Sanoop Dinesh, and Alberto Crespo Inesta. Directed by: Angeleene Abraham, Gautam Marathe, and Sanoop Dinesh. Cast: Gautam Marathe, Ro Gilbert, Magy George,, Sanoop Dinesh, Zakaia Cvitanovich. Venue: The Cultural Centre, The National Theatre. 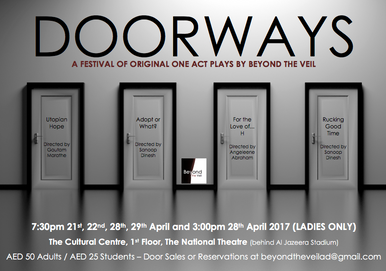 Background: Doorways was a festival of four original one-act plays written by Beyond the Veil company members. 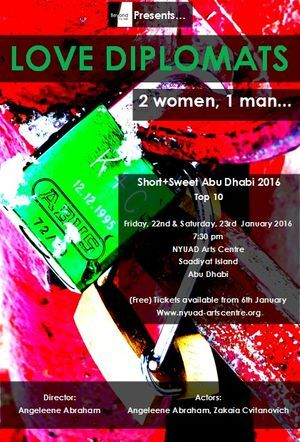 Each play had previously been performed at Short+Sweet Abu Dhabi. Synopsis: For details on each play (Rucking Good Time, Utopian Hope, For the Love of... H, and Adopt or What? ), read the synopses below. Season: 20th - 21st January, 2017. Background: This play started from a concept close to Sanoop's heart. It won Best Female Actor, New Comer. 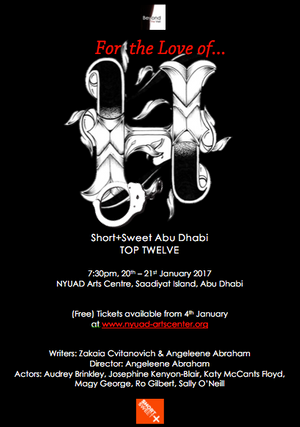 It was performed in the Wildcards at Short+Sweet Dubai 2017 and got through to the second round. Synopsis: A couple, under tremendous pressure to procreate, discuss alternative ways of starting a family. But will their parents be satisfied? Are they ready to start a family? Background: This is a play that's been waiting to be written for years. Angeleene had the concept and together we put it in writing. The concept developed from a fascination with Anne... but I'll say no more so not to ruin the surprise. Synopsis: People love for many different reasons – for family, for youth, for companionship. But love is never easy... especially when there are more than two people in the equation. 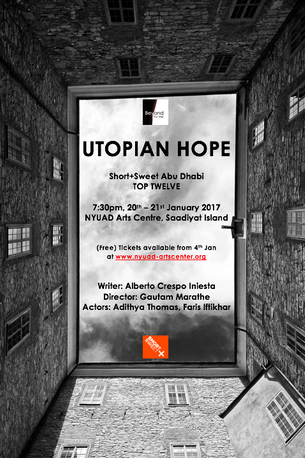 Background: Originally written in Spanish, Utopian Hope is a cleverly written play about the state of the world as it is now and hopes for the future. Synopsis: While waiting for a train, two men discuss the meaning of life and what is wrong with society. More questions remain unanswered than answered. Cast: Gautam Marathe, Alberto Crespo Iniesta, Josephine Kenyon-Blair, Carlos Paez, Ro Gilbert, Magy George,, Sanoop Dinesh, Zakaia Cvitanovich. Background: Written in 2015, More Words is a psychological probe into the universal concepts of family, loyalty and duty. As a social commentary, it allows reflection through surrealism. However, the comedy doesn’t detract from the poignant message of the importance of responsibility. Synopsis: Fayyad keeps exotic animals but his aid, Sundos, is the one who puts her life on the line to care for them. Abu Nofal is looking forward to the return of his son, but it doesn’t quite work out the way he’s expecting, much to Um Nofal’s dismay. A drought has everybody on edge, including the nomads, animals and pirates. Yes… there are pirates too. Innovation: Pirates, breaking the fourth wall, two choreographed death scenes. Cast: Ro Gilbert, Magy George, Craig P. Kelly, Derick Downing, Zakaia Cvitanovich. Season: 20th - 23rd April 2016. Venue: The Emirates Writer's Union, The National Theatre. Background: Written in 2009, Take the Ground is a social commentary inspired by the concept of fear. The play is essentially about how paralyzing fear can be if it’s not controlled. Synopsis: Fetoun, a kernel’s seller, has undergone a terrible incident – one that has affected her emotionally and physically. We meet her when she has finally got to a point in her life where she can continue on her path. Although her emotional scars are visible to all, she is able to function. That is, until she comes across the man responsible for her downfall. Her determined harassment of the three travellers at the bus station, a place where the mad come and go in peace, results in a re-enactment of the past. Innovation: Ladies Night, a cappela, and what we refer to as 'chimping'. Season: 22nd - 23rd January, 2016. Background: Written in 2014, Love Diplomats is a cleverly written play about a love triangle. Synopsis: While doing the books over her morning coffee, Estel is interrupted by Isobel, the other woman. Isobel has turned up to tell Estel to give Angel up - after all, her and her son need him more than the barren Estel does. After much arguing, deliberating, and even a touch of amiable conversation, Estel finally sees the chance she needs to put Isobel in her place. And that, she does! 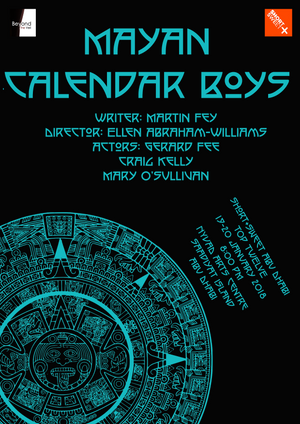 Cast: Rob Reader, Ray Cunningham, Adithya Thomas Prakash, Stephen Tofts. Background: Written in 2016, Rucking Good Time is a fun look examining the concept that things aren't always as they seem. Synopsis: Savage is waiting for his team-mates in the locker room, doing some press ups and other manly stuff. The other guys gradually turn up... first Simple, then Smooth and Sweet. The guys are getting ready for practice... or are they? The group dynamics chop and change throughout the dialogue, with it nearly coming to blows on a couple of occasions. A rugby ball gets passed around, as do socks (as part of a sock-swap ritual), and then the guys turn away from the audience and put on the final part of their uniform... their tutus. Cast: Rob Reader, Sanoop Dinesh, Muatasem Alshaibi, Fatima-Zahra El Habachi, Niels Hamilton, Ahmad Hasan, Carlos Paez, Darko Dimeski, Ray Cunningham, Nagham Ariqat, Khristene Astoriano. Season: 18th - 21st November 2015. Venue: The Conference and Lecture Room, MCYCD Cultural Centre. 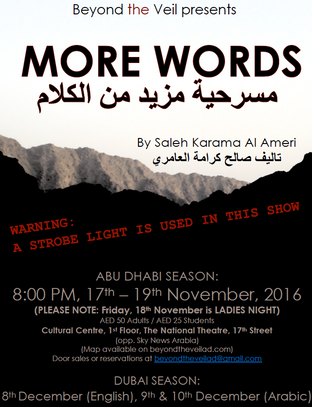 Background: Written in 2013, the play is based on an incident witnessed by the playwright, and examines charity, loyalty and honour. As a social commentary, it allows self-reflection through comedy. But the comedy doesn’t detract from the poignant message of how we treat the weaker members of society. Synopsis: Qen, a beggar, decides to get a cup of coffee with the money given to him by a man leaving a café. However, the waiter refuses to serve him on the grounds he’d be bad for business. A phone rings… it’s the man’s. It’s answered. He wants to gift Qen his phone, and the bag of cash he also left. But Qen refuses to accept the gifts. Accepting gifts is a betrayal of the beggars’ code of honour. Innovation: Ladies Night (first time in the UAE), cellphone juggling, death by train. 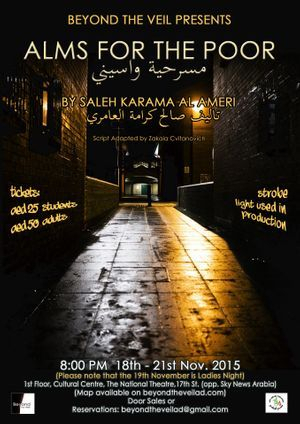 Cast: Assyl Yacine; Samah Konia; Zaki Ajjawai; Amir Daou; Kathleen Moran; Valerie Ryan Miller; Ahmad Jasim. Season: 25th - 27th March 2015. Background: Written in 2012, The Great Redeemer tells the story of how quickly appropriate behaviour can be forgotten when surrounded by chaos. It shows how the effects of societal instability affects people, by asking what is acceptable behaviour, and if it’s easier to behave inappropriately when everything around you is breaking down. Synopsis: Mayara accepts a dinner invitation from Jaddad, not realising that to him, it's more. They go back to her apartment where her flatmates are all busy on their computers. This wasn't the outcome Jaddad was expecting. And in the end, the outcome is not what Mayara and her flatmates were expecting. The outcome? That was for the audience to determine. Innovation: For the first time in the UAE, the audience chose the ending of the show from three alternatives. 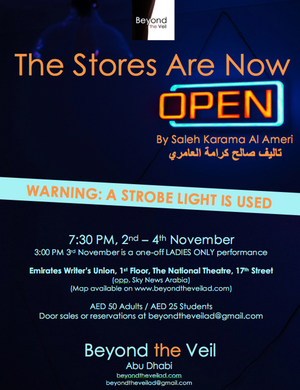 The inaugural performance by Beyond the Veil will be the first English staging of a new play by Saleh Karama Al Ameri in March, 2015. 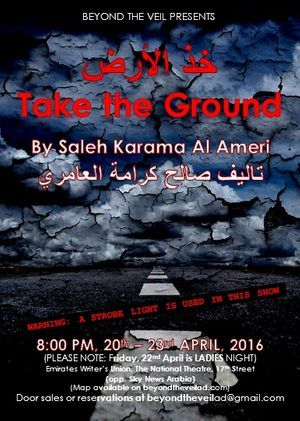 The Greet Redeemer, in absolute Al Ameri fashion, is a play about the human condition. It asks probing questions about behavior and how easy it is for appropriate behavior to be lost.